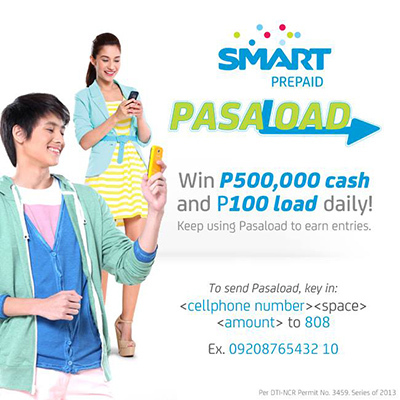 Join the Smart Prepaid PASALOAD Promo, and get a chance to win half a million pesos cash and load daily! Simply use the ‪#‎SmartPrepaid‬ Pasaload service, even receivers get a chance to win. Hurry! Pasaload Now! Promo runs from June 18- September 15, 2013. Visit www1.smart.com.ph for more details and see Smart Communications Facebook page for latest updates.